Scientists in the Pacific Northwest are studying more than a dozen watersheds to develop templates on habitat restoration. The templates could be used in similar streams to bolster struggling fish populations. 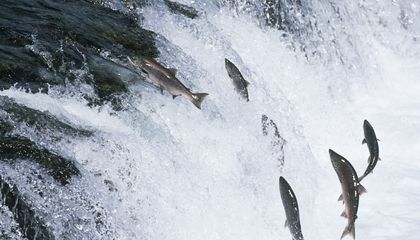 The federal government lists 28 populations of salmon and steelhead on the West Coast that need protections due to low numbers. This is despite spending millions of dollars every year on restoration efforts. The studies aim to make those efforts more successful. They focus on 17 watersheds in Washington, Oregon, Idaho, Northern California and British Columbia. They examine the benefit of everything from dam removal to building artificial beaver dams in tributaries. Creating templates for habitat restoration could save time and money by using strategies known to produce good results in similar habitats in the region, said George Pess. He is a research fisheries biologist for the National Oceanic and Atmospheric Administration. "The overall goal is to learn enough to be smart about our restoration," he said, noting that the studies will offer recommendations to private, tribal and government entities but won't produce any legally binding regulations. Most of the studies began in the 2000s. Pess said scientists are still discovering what works and the program will require years of monitoring. They are examining how fish use waterways and the challenges salmon and steelhead face throughout their lives in the different watersheds. Last year, state workers for the first time counted steelhead-spawning beds above an area where a dam had been removed, said Brian Knoth. He is a fisheries biologist with the Idaho Department of Fish and Game. The dams help the fish because of the water, they need to drink it. I chose this article because I also wanted to know how the fish survived. Dams help the fish by giving them a new area to spawn in. It gives the fish a wider area to live. It helps the scientists by giving them new reasons to study how fish live. Dams help the fish by opening up new homes and areas for them to live with more water to help them survive. "That opens up spawning habitat." I always looked at dams as a dangerous thing, but they can, also help fish find more places to live and they prove to actually be very helpful. Dams help fish by giving them a new area to live and repopulate in.It also helps them by helping them to not get eaten by other predators such as Grizzly bears and people. I think that the people are doing a good job to help the species of fish that are low or endangered. Some people are removing dams or tracking fish down to see what strategy works and what don't. Some have also built artificial dams which some animals come out and expand. I hope that the people will be successful and help the species of the fish or animals to grow and prosper. It will be bad if a species of animals go extinct. Many people are still researching and trying to find different ways to help. Dams help fish because it opens up a new spawning habitat. Dams help the fish by opening up new homes and areas for them to live with more water to help them survive. CTQ: Dams help fish by making a blockade so fish do not swim to far up or down stream.